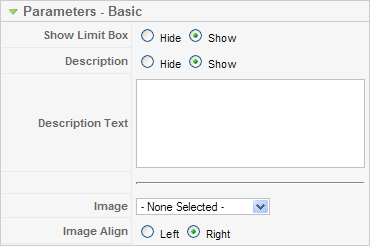 The Category List Layout has the following Basic Parameters, as shown below. Description. Hide or Show the News Feed Description Text, entered below. If 'Show' is selected, the Description text will be displayed just below the Page Title. Description Text. The text to display as the News Feed Description. Image. Image for this Page. Image must be located in the folder "images/stories". This page was last modified on 13 July 2010, at 09:31.